During either player’s turn, when a card effect is activated in your opponent’s Graveyard, you can send this card from your hand to the Graveyard to negate the effect. Welcome to the new Pojo.com! Still getting used to it myself, probably made a few mistakes already >__< sorry Pojo, this old man is new to WordPress. Anyways, lets get things started with Skull Meister. Grave effects are so important in the meta. So many things activate in the graveyard and can launch big turns. Skull Meister is a nice hand trap that can deal with one of those effects in response to its activation. The problem is that it can only deal with one. It isn’t like Droll and Lock Bird which locks down your opponent for the rest of the turn with its effect. I’d argue that Soul Drain is so much better, but Skull Meister can at least stop a grave effect without having to set it. Also, being able to stop a grave effect before you’ve even had a turn at the start of the game is great. Plenty of decks are hurt by this card, but its inability to lock the opponent out of grave effects for the rest of the turn, as well as its inability to be searched that hurts it. A side deck card absolutely, but I think Soul Drain is much better. Skull Meister is a Level 4 Dark Fiend-type monster with 1700 Atk and 400 Def. Aside from average stats, it can be a hand trap to negate a card or effect from activating in the grave. Skull Meister is sent to the grave as cost, but if you have multiple in your hand, you can use multiple of them to negate cards or effects. That being said, there are better hand traps. I would suggest this to budget players or if those better hand traps get banned. Its main use is going to be in the side deck anyway. 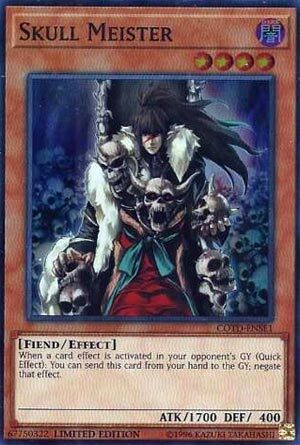 Skull Meister is a hand trap that allows you to discard him to the GY to negate an effect in the GY. There are several decks that this can hinder, from Dinosaurs, to True Draco, to SPYRAL (Quik-Fix’s revival effect for those wondering), Burning Abyss, Shaddoll, Invocation, any relevant meta deck or potentially powerful engine can be stopped with Skull Meister. Also, when in doubt, he is a Level 4, which is good for XYZ plays. Keep him in the side deck if the meta calls for it. Hello Pojo and Yugioh fans! Welcome to our new website and layout for CotD! This is an exciting time, and to quote Pojo “we needed a facelift” so I hope everyone enjoys everything this has in store. Opening the week is a fairly useful Monster, in Skull Meister. Dark and Fiend are good, Level 4 with 1700 attack makes this guy a solid attacker as well. This Monster has a Quick effect, simple as it may be. He can be discarded from your Hand to the Graveyard to negate the activation of an effect in your opponent’s Graveyard. While I consider this effect to be good, the problem I see is that you can only use this effect one time. Obviously dependent on being in your Hand too, not that we hold that too much against this card. Useful Tech? Perhaps, and as referred, it should at least find a home in Fiends.